Maybe you have been envious of friends or neighbors when they talk about taking fun trips in their RVs. You might be thinking that a fully-equipped RV is out of your price range. Pedata RV Center is here to tell you that you can afford a terrific used motorhome, with low miles and superb amenities. In fact, you can buy this motorhome online, as we have many models for sale to choose from. Let’s take a look at how to buy a great used RV from Pedata. 1) Select your favorite models from our outstanding used motorhome inventory. 2) Note the incredible Pedata savings on each model versus the retail price! 3) View all the photos and details of the RVs on your short list. Then schedule a live virtual tour which allows you to ask a live Pedata representative to maneuver the camera any way you would like to see every inch of the motorhome. This is a comprehensive, live tour that will help you select the perfect RV. 4) Next we encourage you to visit our Tucson, AZ dealership where you have the opportunity to save up to $10,000 off an RV, versus one you might buy locally. We call it avoiding ‘the $10,000 mistake’. That means that a drive or flight to see us (and we’ll even pay up to $500 towards your airfare if you buy from us) can really pay off with a great used motorhome at a substantial discount over what you would pay elsewhere. One of the other great reasons to buy a used RV online with Pedata is our financing options. Select your RV and then come see us and we’ll get all the financing details worked out so you can look forward to enjoying your new motorhome. We’ll even deliver it to your home, if you like (fees apply, ask about this service when you visit our dealership). Don’t forget! Our used motorhomes let you travel anywhere with all the comforts you expect, like air conditioning, dishwasher, satellite TV and more (each RV will have its own amenities list, these are highlights of some of them). The open road beckons when you drive a quality used RV from Pedata RV Center. Ready to save thousands on a late model used motorhome? 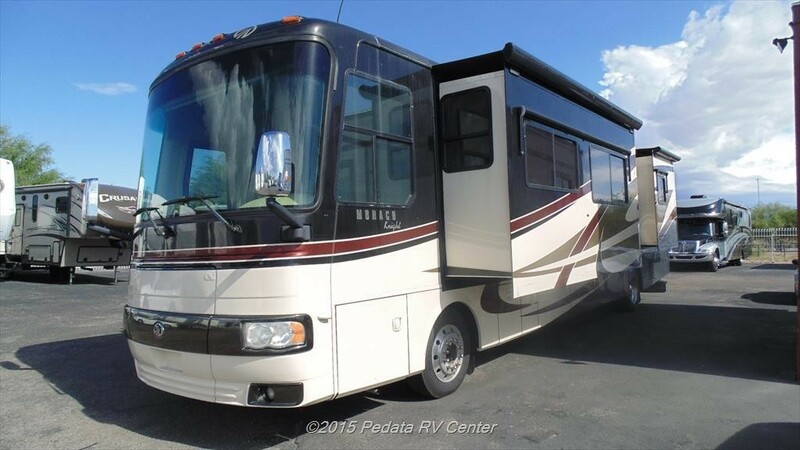 Start shopping online for a used RV with Pedata RV Center, the online RV sales experts.